This week we’re doing another book on Logic! Mendelson does an ok job with his book in introductory logic. He sets up a nice introduction to logic concepts, but then fails to deliver much needed exposition. 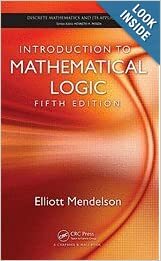 Although the book is very descriptive and helps to get your hands very dirty in logic, it can sometimes be a little to follow what Mendelson is trying to prove and whether a certain problem is an exercise or a proof. Although at times it’s a little hard to follow this text does give an amazing introduction to the topic of logic. It doesn’t assume any presupposed knowledge and actually goes over almost every topic that a new student would be expected to know in the topic. Not only that, but he also breaks down Number Theory to prove Gödel’s incompleteness theorem and also does a fairly good job of showing the different axiomatizations of set theory. Not only that, but his introduction to second-order logic and modal theory are also fairly nicely laid out. I chose not to look at his computability section as it seemed that it would be lacking since it only seemed to barely touch on the subject and there are tons of books out there that go more in depth on the topic and do a phenomenal job. I’d definitely recommend this book with a secondary companion text to help guide you along if you have trouble understanding what Mendelson is trying to state.